Zimbra Collaboration Suite (ZCS) - программный продукт для автоматизации совместной деятельности рабочих групп, созданный компанией Zimbra, находящейся в Сан Матео, штат Калифорния, США. В сентябре 2007 года компания была куплена Yahoo!, а в январе 2010 VMware объявила о покупке у компании Yahoo подразделения Zimbra. В июле 2013 была куплена компанией Telligent Systems. Среди продуктов для работы с электронной почтой Zimbra больше других похожа на Microsoft Exchange, а по своим возможностям сравнивается с Google Docs и Google Apps. ZCS предлагается в пяти версиях: Open Source Edition, Consumer Edition, Business Email Edition, Standard Edition, Professional Edition. Версии Consumer Edition и Business Email Edition доступны только для хостинг-провайдеров. В состав ZCS входят клиентское и серверное программное обеспечение. Zimbra Web Client — веб-клиент для совместной работы, поддерживающий email и group calendars. Пользовательский интерфейс Zimbra Web Client построен с использованием технологии AJAX, обеспечивающей всплывающие подсказки, перемещаемые объекты и контекстные меню. Также включены продвинутые возможности поиска и временные зависимости. Сюда же входят онлайн-документация, модули Zimlet и полноценный интерфейс для администраторов, написанные с помощью Zimbra Ajax Toolkit. Zimbra Desktop — клиент для совместной работы. Может использоваться в качестве почтового клиента для любого почтового сервиса, поддерживающего протоколы POP и IMAP. Поддерживает синхронизацию почты, контактов и календарей c сервисами от Zimbra, Yahoo! Mail и GMail. Клиент доступен на платформах Linux, Windows и Mac OS X.
Zimbra Server — использует несколько СПО-проектов. Он раскрывает SOAP-интерфейс программирования приложений во всей его функциональности и также является IMAP- и POP3-сервером. Сервер доступен на платформах Linux (Red Hat Enterprise, Fedora, Ubuntu, Debian, Mandriva, SUSE Linux) и Mac OS X.
ZCS совместим как с проприетарными клиентами, такими как Microsoft Outlook и Apple Mail, при помощи проприетарных модулей, так и с открытым Novell Evolution, так что письма, контакты и объекты календаря могут быть перенесены из них в ZCS-сервер. Zimbra также обеспечивает простую двустороннюю синхронизацию со многими мобильными устройствами (Nokia Eseries, BlackBerry, Windows Mobile, iPhone с прошивкой 2.0). 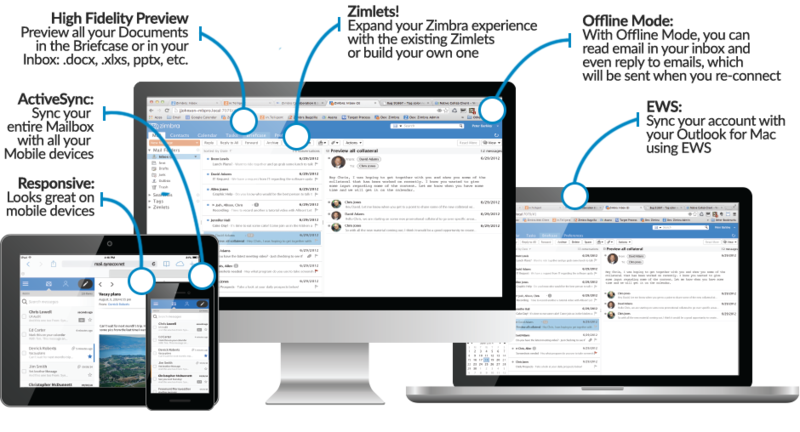 Zimbra Collaboration Suite (ZCS) is a collaborative software suite, that includes an email server and web client. Zimbra was initially developed by LiquidSys, which changed their name to Zimbra, Inc. on 26 July 2005. The Zimbra Collaboration Suite was first released in 2005. The company was subsequently purchased by Yahoo! on September 17, 2007, and later sold to VMware on January 12, 2010. In July 2013, it was sold by VMware to Telligent Systems which changed its name to Zimbra, Inc. in September 2013. It was then acquired by Synacor Inc on 18 August 2015. According to former Zimbra President and CTO Scott Dietzen, the name for Zimbra is derived from the song "I Zimbra" by Talking Heads. Enterprise-level messaging and videoconferencing licenses can now be purchased for Zimbra Network Edition – with no third-party products and simple installation. Give your users everything they need to collaborate with coworkers, all inside the communication tool they use the most – Zimbra. Includes file and screen sharing plus corporate messaging and unlimited videoconferencing. With Zimbra Docs, users can create and collaborate real-time using documents, spreadsheets and presentations right inside the Zimbra Web Client. The Zimbra Docs feature is in the Zimbra Briefcase tab, and it is based on LibreOffice. Zimbra’s new realtime backup and restore engine backs up every single item and event on your server with split second precision. Avoid data loss using atomic and ever-consistent algorithms, while still saving disk space — up to 50% — thanks to an intelligent deduplication and compression system. It offers six restore features, that are all transparent to the end-user and are 100% OS, architecture and version independent. In minutes, you can now grant Delegated Admin rights to users, allowing them to perform management tasks such as setting quotas, COS and user limits for your domains. Keep track of your Delegated Admins’ actions and your domain status with new reporting features, straight from your Zimbra Administration Console thanks to the dedicated Administration Zimlet. With Zimbra Collaboration Hierarchical Storage Management, you can tier your storage, moving old information to less expensive storage. Have you had performance issues or outages due to IMAP usage? Zimbra 8.8 has refactored IMAP services to run separately from all other Zimbra services. IMAP will no longer affect your company’s SLAs! Zimbra 8.8 also has improved SIEVE RFC compliance, offering administrators greater email filtering. This is a compatibility release - Zimbra 8.8.9 is now fully supported. Sensitive S3 volume information is not displayed in the logs anymore. Fixed a bug that could cause S3 volumes to become unavailable without a valid license. Hierarchical Address Book (Beta) - An Hierarchical Address Book (HAB) is an enhancement of the Global Address List (GAL) that includes organization information, enabling contact selection by sub-organization and seniority. This initial Beta gives administrators the ability to add and view organizational data from the Linux console. Office365 - Official Support for Microsoft's subscription-based Office365 desktop Outlook 2016 installation. Outlook 2019 (Beta) - Microsoft released Office 2019 on 24 Sept 2018. ZCO has been updated and tested for compatibility with the 2019 Preview. The Beta designation will be updated based on our testing with the official release, now in progress. Issue Reporting improvements, phase I - This feature aims to reduce TCO and improve support by helping to obtain more complete information about problems earlier. Phase I expands user's log file file management capabilities, and introduces the ability to securely share compressed logs with administrators via Zimbra Briefcase. Zimbra Docs integrates with Zimbra Drive V2 (Beta). On LOOL Server, enabled file logging on information level by default, created the directory /opt/zimbra/log/when installing docs. With Zimbra in http-only mode but using an external reverse proxy for https, docs will now use the zimbraPublicServiceProtocol attribute and redirect to the appropriate URL. In all previous versions, Docs was unusable in this configuration. Fixed an Admin Zimlet issue that allowed to set an end date of a restore occurring earlier than the start date. Fixed an issue that could cause high CPU usage when the Backup module or the RealTime Scanner are disabled. Logging has been improved to better handle missing BLOBs. Index volumes can now be created and managed on the Zextras Administration Zimlet. The output and logging of the doDeduplicate operation have been improved and tidied up. Fixed an Admin Zimlet issue that could cause no information to appear in the ZxChat section of a Domain's configuration. Fixed an issue that could cause a wrong Update Notice to appear mentioning a zimlet version with a long micro release number. Improved External Restore in order to avoid non-existent COS IDs causing the operation to fail. Fixed an issue in the RealTime Scanner. Fixed an issue that could cause some attachments to be indexed poorly.